About My Postcard, Trade Card Blog! Interesting historical tidbits and trivia about old postcards, and Victorian trade cards, along with the occasional amusing postcard message. I am fascinated with Victorian fashions. My many blog posts on the subject attest to that. I believe Victorian fashions have more personality and style than many of today’s fashions. Sorry Lady Gaga. However, today’s blog post is about the opposite. It is about a piece of clothing with no personality or style. This blog post is about a Victorian era hat called a “mob cap”. The mob cap is simple and serves a basic function – to keep a servant’s hair clean. 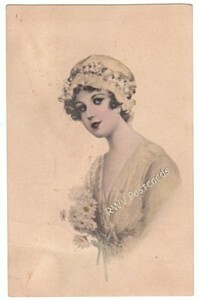 The woman in the below vintage postcard is wearing a hat similar to a mop cap (minus the flowers). It looks rather plain in comparison to other Victorian era hats with feathers and ribbons. 1913 vintage postcard published by Ullman of lady wearing hat similar to a mob cap. * More vintage postcards of woman wearing Victorian fashions can be found in my web store, Remember When Vintage Postcards. * Be sure to stop back in a couple of days to find out a postcard message’s contribution to winter in April 1909 Redwood Falls, MN. 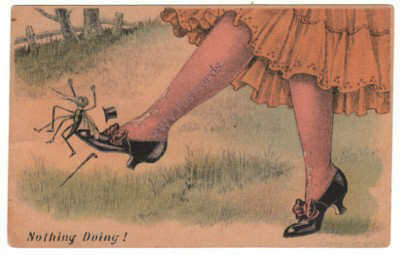 I came across an unusual (for me) old vintage postcard of a dressed grasshopper being kicked by a lady’s legs. It wasn’t the unusual image of the grasshopper that caught my eye, but the adornment on the lady’s legs. It looks like the lady is wearing embroidered stockings. I did some research on Victorian clothing and found out embroidery on lady’s stockings wasn’t unusual. I am wondering how the stockings stood up against wear and tear. Did they run just as easily as today’s nylons? Shame if they did as this piece of Victorian clothing is really quite beautiful. Funny how it is sometimes the small detail on a postcard that catches a collector’s eye. 1911 Vintage Postcard Copyrighted by L.H. You can find more unusual fantasy postcards in my store, Remember When Vintage Postcards. ** If you liked this blog post about Victorian lady’s fashions, please click on the bookmark button to the lower right. I missed last week’s weekly ephemera trivia, so thought I’d catch up with this blog post. Ever wonder where the expression, “the bogey man is coming to get you!” came from? It turns out Napoleon is responsible. Napoleon’s nickname “bogey” (from Bonaparte – boney to bogey) resulted from an act of revenge. He blockaded Britain’s coast in the very early 1800’s due to the defeat of his fleet at Trafalgar. This resulted in the serious depletion of imported silk thread in Britain. The price of smuggled silk thread skyrocketed. That was naughty Napoleon. We women needed that silk thread for all those pretty Victorian fashions. Patrick Clark came to the rescue of British ladies by inventing hand sewing thread (2-4 cord) from a material readily available – cotton. Patrick’s grandson, George, later invented a six-cord thread strong enough for sewing machines (circa mid-1800). It was called ONT, which stood for “Our New Thread”. 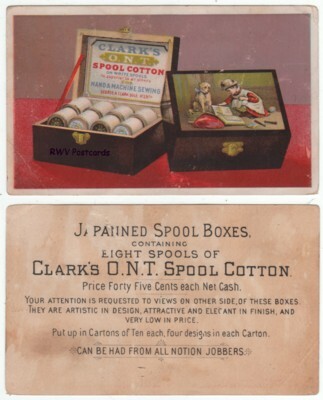 ** If you liked this blog post on the above Victorian trade card’s product (sewing thread), please click on the bookmark button to the lower right. I wondered how Victorian fashions were kept clean. Excelsior Starch Manufacturing Company provided the answer. This company was started in June, 1873, with $30,000 in capital. The factory (or works) comprised a 110 x 150 foot four floor brick building (the graphics on the Victorian trade card to the left says otherwise, so am not sure on this point). All kinds of starch were made using corn; from packages in any desired weight for use in preparing dishes for the table, to laundry (I was unaware a laundry product could be made from corn), and other starch grades. Absolute chemical purity was the standard of excellence. At first, the works consumed about 40 bushels of corn per day, and employed no more than 10. By 1880, the works employed 60 to 70, with an average daily consumption of 800 bushels of corn. This increase showed how prosperous Excelsior had become, with an annual products value that had reached about $125,000. Peltire Hill was Excelsior’s superintendant at the beginning. Mr. Hill was viewed as a practical man who understood starch making and the machinery used in it’s making. He’d gained experience as foreman of Buffalo’s famous Gilbert’s Starch Works, supervised the construction of the Muzzy & Sage Starch Mill upon arrival in Elkhart in 1870, and then supervised the successful installation of Excelsior’s company works. Mr. Hill’s experience sounds like the forerunner of today’s millwright trade. This experience helped propel Mr. Hill from vice president in the company’s second year, to president in 1880. 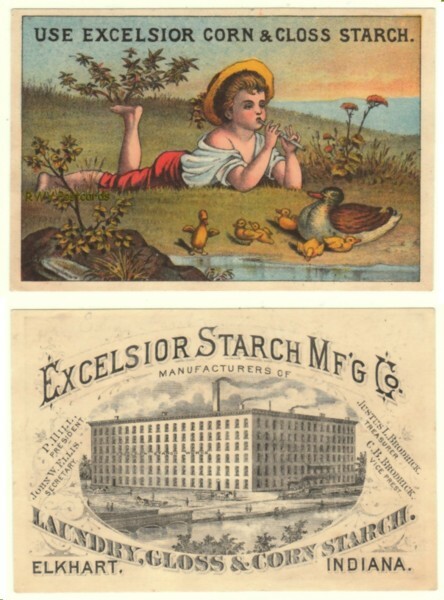 The Excelsior Starch Works was one of the few in the country which manufactured by the same chemical process as the more famous Duryea Co.
More wonderful victorian trade cards like the above trade card, with great graphics and advertising, can be found in my store. ** If you liked this blog post, please click on the bookmark link to the right. One of my favorite non-Santa Claus vintage postcards is the one to the left signed by artist May Farini. It pictures a Victorian lady on a ship’s deck wearing a long coat called a Duster. Ladies wore them to keep dust off their legs when walking or touring before paved roads came along. There are no dirt roads around her, so she must be wearing the Duster coat to keep the chilly wind off her. Feel free to look at other Santa Claus, children in footed pajamas, and May Farini postcards from my personal collection on my web store’s gallery page. ** If you like this blog post and want to share it, please click on the bookmark link to the right.